Summer’s here!!! No doubt about it. Hope you are employing all the techniques you know to stay cool. It’s time to pick up that summer reading. Affordable Housing Tour: About 20 neighbors and city staff toured three affordable housing projects around the community. The first was in our River Road Neighborhood: Turtle Creek near Northwest Expressway. The second was Bascom Village I, and the third was Willakenzie Crossing. To say the least, it was a very hot evening. In a couple of places, we spent time in their well-used community buildings. That took some of the edge off of the heat. 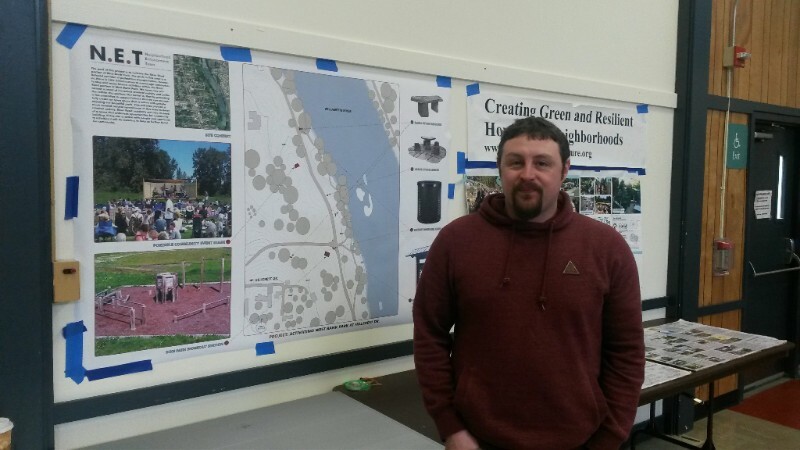 Turtle Creek is a Lane County ‘Homes for Good’ project, located just off of North Park Avenue. It was built in 2008 with 27 units and includes resident services. As an older development, it has fewer energy efficient amenities. Newer projects include solar panels and heat pumps. The community garden is better utilized this year than in other years, but it is still ‘rustic’–in the words of our guide. Many questions from River Road neighbors circled around environmental topics: community gardens, edible landscaping, water catchment, energy-efficient architectural levels, solar energy production, and efficient heating/cooling equipment. Other questions related to building community and social fabric. Bascom Village I is run by St. Vincent de Paul and was built in 2016. It is located north of Beltline to the west of Coburg Road. It contains 53 units (at 20 units per acre) and includes a community room, playground, and resident services program. It, too, had a community garden. Willakenzie Crossing is a Cornerstone Community Housing development. Completed in 2013, it contains 56 units on 2 acres including 16 for disabled adults. This is the only project with extra care for people with mental disabilities. Amenities include community center, resident services, garden plot, and children’s play area. It is also located next to a large open park. Neighbors to the south can meander through Willakenzie Crossing to the park, and they feel welcomed. Adjacent to the project is the Mckenzie Mohawk Grange. Staff emphasized the quality partnerships they have with the Grange and Harlow Neighborhood association had a welcoming party at the Grange when Willakenzie Crossing opened. The Grange continues to hold ice cream socials and holiday parties with the residents. The project feels welcomed to the community in a mutually beneficial relationship. I was particularly struck by how attractive the housing was in all locations. Nice designs with porches on the front, attractive paint jobs, and beautiful landscaping–lots of open spaces. I didn’t see a weed anywhere, and I know how hard Pat and I have to work to get half-way around our yard each year. All projects have community garden spaces. The garden at Willakenzie has 8 plots, and the residents didn’t step up in the number needed to fill it out; so they handed it over to the children as a growing/learning activity. It was flourishing beautifully! The amount of green spaces, well landscaped, was awesome. As one of our guides said, these spaces are needed ‘as people spill out of their homes.’ We saw lots of residents on the streets or meandering the sidewalks–finding a breath of fresh air and camaraderie with their neighbors and visiting friends. The other aspect that I consider central to a thriving community are programs that support the people who live there. The community centers seem to be a busy hub of activities with participation from Food For Lane County, community farmers’ markets–including produce from their community gardens, classes by Extension Services, children’s play areas during classes for parents, homework helpers for children, and a Rising Star program to encourage children to accomplish their goals. The really touching image that stays with me was when we were standing outside Willakenzie, trying to listen to our guide and feeling very hot, a young girl with her scooter went by on the sidewalk and waved at us. It was such a friendly moment. I understand that residents have been surveyed as to how satisfied they are in living there, its safety, affordability, access to jobs and schools, and sense of it being a healthy environment for their families. We don’t have to take the word of those who build and manage the properties. Reports are available with that resident info. Here is the link: https://www.eugene-or.gov/871/HUD-Consolidated-Plan. This is all in preparation for the new affordable housing project to be built East of River Road, North of Dari Mart, near Maynard. First hand information about how projects are planned, designed, built, managed, and maintained is valuable in understanding accurately what will occur. A community meeting will be held on WEDNESDAY, August 22, 7:00 p.m. Dayspring Fellowship Church, 1580 River Road. SATURDAY, August 18, 5:00 to 7:00 p.m. RRCO Potluck Picnic at Emerald Park, Structure #2 north of restrooms.) Biodegradable plates and utensils provided. MONDAY, August 20, 7:00 p.m. RRCO Board meeting. River Road Annex. TUESDAY, August 21, 6:00 p.m. Neighborhood Planning Community Advisory Committee, North Eugene High School. Planning for our next Neighborhood Planning work groups and Fall public event. WEDNESDAY, August 22, 7:00 p.m. Dayspring Fellowship Church, 1580 River Road. Neighborhood meeting for property planned for affordable housing, north of River Road Dari Mart. TUESDAY, August 21, 2018, 5:30 to 7:30, Party in the Parks, Arrowhead Park. Using seven marimbas, singing, drums, and other percussion, Kudana Marimba engages audiences throughout the Pacific Northwest with traditional Zimbabwean music. The Teach-In that will describe many aspects of the River Road Santa Clara Neighborhood Planning Process [NPP]. The Planning Process, a partnership with the city of Eugene, is a unique and unprecedented opportunity for neighborhood residents to help influence how River Road and Santa Clara evolve into the future. Issues and topics will include land use, economic development, open space, transportation, resilience, public participation and much more. Many of us would like to see a more green and sustainable River Road. Important to know, city planning goals found in Envision Eugene, include many references to walkable neighborhoods, encouraging alternatives to automobiles, local economic development, restoration of natural habitat, addressing climate change and much more. The eventual “refinement plan” that will guide how the neighborhoods evolve can encourage and provide incentives for green and resilient outcomes. The Teach-In will touch on several important topics such as home produced food, energy and water along with “missing middle” housing. The Teach-In will feature eco-friendly storm water management, mindful economic development, preparedness and how people in RR and SC can help make the Neighborhood Planning Process a success. There will also be posters [some free for the taking] and graphics about all these topics with people on hand to help explain their meaning. The Teach-In is an important educational event that can empower participants to know more how to help make their lives at home, neighborhood and community more green and resilient. River Road is privileged to have a Propagation Fair and Seed Swap right here at our very own Rec Center on Lake Drive. The Rec Center helps bring about yet another important public event! The Prop Fair and Seed Swap will be Saturday, April 7 from 1 to 4 PM, Its free. There will be hundreds of varieties of fruit tree scions [first year shoots], from pear, apple, peach trees. Other trees, too like figs, apricots and more. Root stock costs $2. You choose your scion, all nicely labeled, and experts will graft your scion onto the root stock of your choice – dwarf, semi dwarf, full size. Take them home, plant, harvest, produce more food where you live! There will also be all kinds of veggie and herb seeds to browse and take home. Bring seeds you have to swap, but make sure they are accurately labeled. There will also be potted culinary and medicinal plants for sale, both annuals and perrenials. The Fair is fun, social and a volunteer effort. Land Use 101: Confused about how land use works in Eugene and don’t know where to start? At our March 12th General Meeting City Planning Staff will present a Land Use 101 program. They will explain the basic philosophy of why we regulate land use and the unique framework of how land use policies and development code are determined in Oregon. They will also describe how applications for development are evaluated for compliance with those policies and code. There also will be time for Q&A from those who attend. This hour of information will provide a great basis for participating in the Land Use portion of our Neighborhood Plan. There are four positions (of nine) open for election to two year terms at our March General Meeting. Board members meet monthly to make decisions and taking action on behalf of the general membership including setting general meeting agendas, determining the work plan for the neighborhood, coordinating with elected officials and public employees as well as and communicating with neighbors. The board meets monthly on the 2nd Monday of the month to discuss these efforts. Expectations of board members beyond attending General and Board meetings include helping coordinate the work of the Neighborhood including serving on committees. The Neighborhood has benefited from board members who have facilitated a new information kiosk in the West Bank Park, worked with County and City officials to mitigate parking issues around ECCO apartments, got the speed limit reduced on River Road to name just a few. Currently we need social media and outreach, and a treasurer. Anyone over the age of 18 who resides, owns property or works in the River Road area is eligible to run. Please consider throwing your hat into the ring and help us improve the Neighborhood even more. For more information contact Jon Belcher at 541-343-6695 or jbelcher@efn.org. Nominations will be taken at the meeting and any neighbor who has attended a RRCO meeting in the past year is eligible to vote in the March 12 election.